The Church of the Holy Meatball came into being when Johnny Spaghetti (Blessed be His memory) ate one of the Flying Spaghetti Monster’s meatballs. Johnny Spaghetti (BbHm) immediately recognized the extreme significance of this act of sacrifice. The full story of the Holy Meatball is told in the Book of Johnny (BbHm). Johnny Spaghetti (BbHm) realized that the Holy Meatball held a message for all of humankind and that he had a moral imperative to Share the Word. The message of the Holy Meatball was as profound as it was simple. The Flying Spaghetti Monster so loved the world, that he gave one of his only begotten Meatballs, that whosoever believeth in him should not perish, but have meat everlasting. The Great Prophet has not been seen publicly for hundreds of years, but rumors of his presence among us still persist. For hundreds of years members of the Church of the Holy Meatball have quietly coexisted with their spiritual cousins in the Mother Church. The Word of Johnny Spaghetti (BbHm) would probably have continued to be shared only between a select and elite group of followers, had it not been for the Great Mission of Mohalla. Mohalla is a follower of Johnny Spaghetti (BbHm) who claims to be in communication with the Great Prophet. Mohallah believes that Word of Johnny Spaghetti (BbHm) should be shared with all of humankind. The Church of the Holy Meatball is a real church. Our faith is backed by the pure scientific theories of the Mother Church. You can become a Ballitarian if you feel the call. Church theology is accepted as divine truth, proven by science, and impossible to disprove. This is not different than any other world religion. Anything that comes across as humor or satire is purely coincidental. 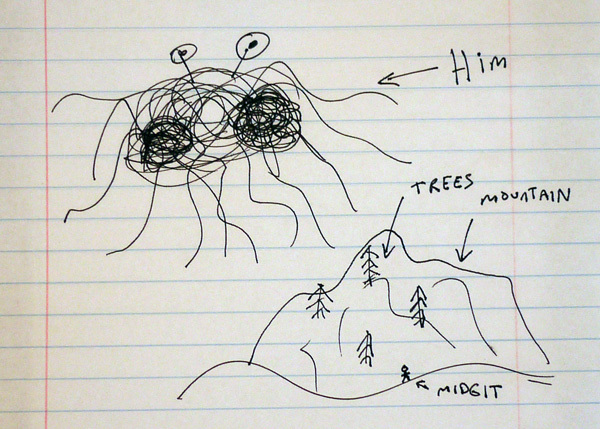 In the beginning the Flying Spaghetti Monster created a mountain, trees, and a midget. Later on the Flying Spaghetti Monster created everything else.